In my experience as a sommelier and restaurateur, I have been very lucky to share my life with professional figures that have enriched my knowledge and experience. 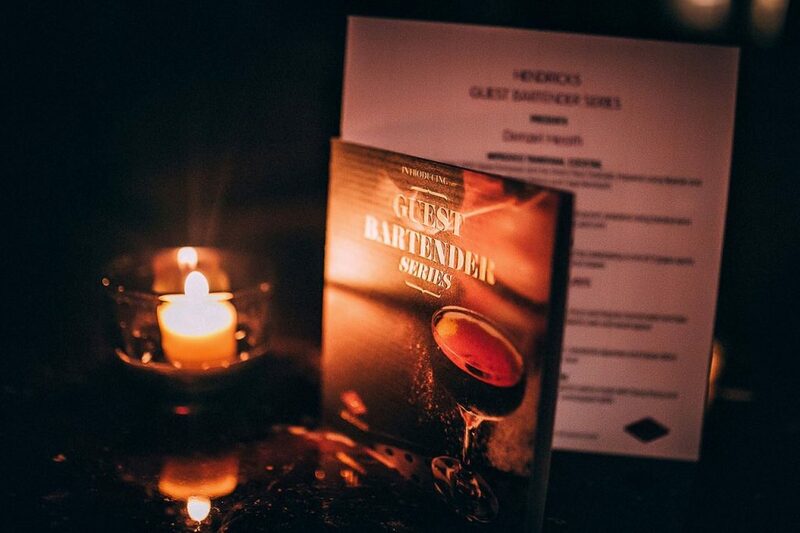 Together with chefs and culinary experts, no one brings this knowledge more than the bartenders. For many years now they have always been out of the spotlight, their world has always been a closed circle for people of the same passion, and their knowledge has been second to none. 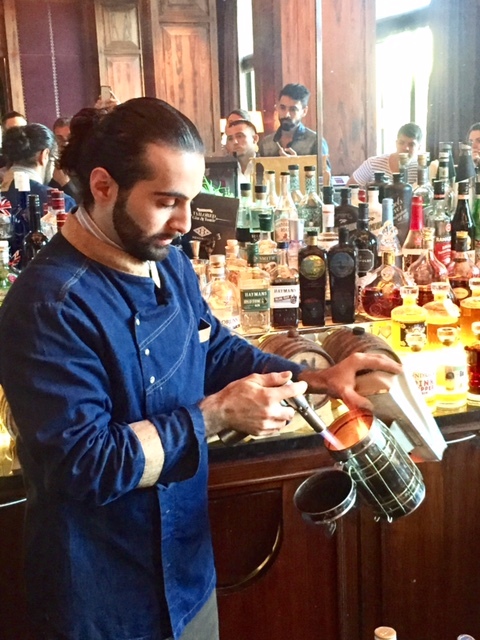 Today bartenders are sharing this knowledge and opening up to others, globetrotting around the world, bringing their experiences and competing each other in the myriads of competitions organized by big brands. They are becoming celebrities in their own world and I wouldn’t be surprised to see a new reality show to be entitled Bars Nightmare or Master Bartender America. The truth is that they deserve the recognition they are now getting as an integral part of our lives. 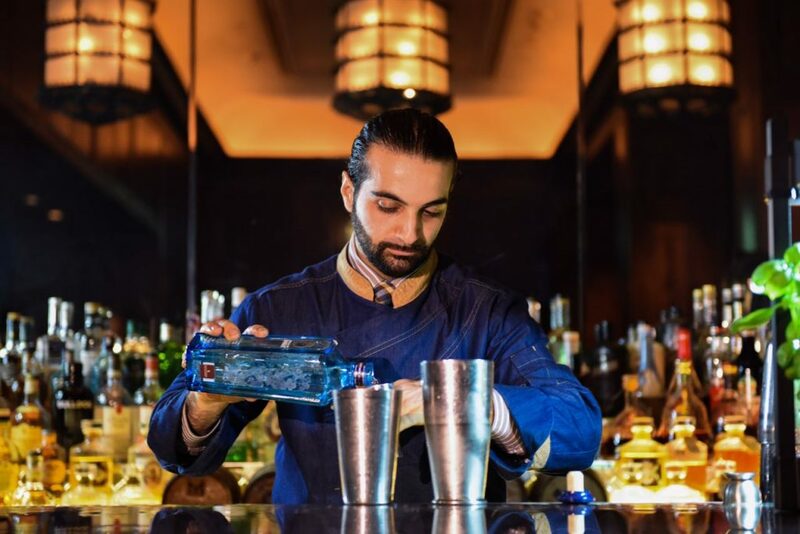 Since opening the first speakeasy in Dubai, and spending lots of time working alongside fantastic bartenders I got more and more fascinated by them, and that’s why I have included these skilled professionals in our blog. Not only bartenders from Dubai, but we are also featuring the so called Guest Bartenders, that are those bartenders that travel the world and pop up in bars for a few days. One such example is Luca Cinalli who arrived at the Hendricks Bar in the Four Seasons Hotel & Resort in Jumeirah for a short stint. 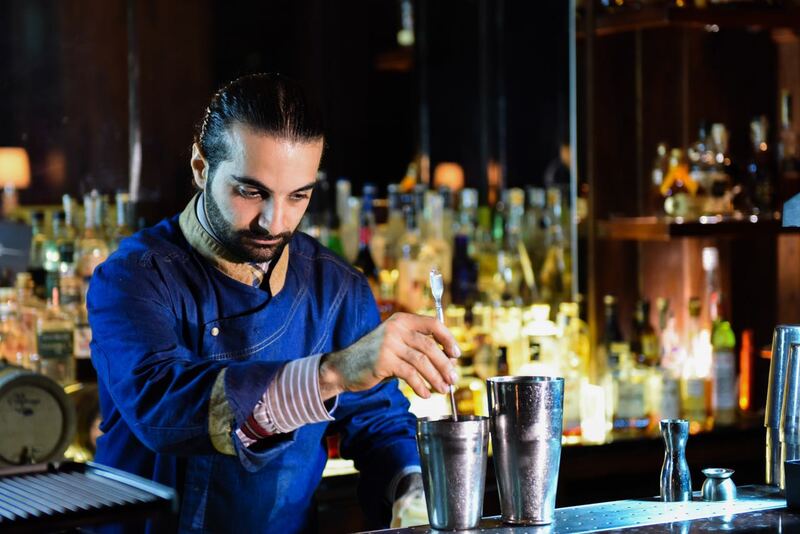 Luca Cinalli is the mastermind bartender behind the Londoner Oriole Bar in Smithfield, 32nd best bar in the world in 2016. He also previously worked at Nightjar Bar during the time when they were awarded the 3rd best bar in the world for four consecutive years (2012-2015). For someone with such a glowing CV, Luca is a very humble and genuine guy, who like me, speaks English with a very strong Italian accent. Before the interview, I attended his master-class for the Dubai bartenders and I have to admit that I was blown away by how he conducted it. Luca spoke to his audiences as if they were his guests and let them understand how with intense research and preparation he exceeds customer expectation. Always putting his clients first, he then introduced certain unique ingredients and techniques such as octopus and squid ink foam. Luca shared his view of bartending from bar design to the spectrum of flavors he explores, to the details in communication with his staff. This is what we call passion delivered on a different level. I went to the interview so amazed that for a few seconds I didn’t know what to say to him other than thank you for this amazing afternoon. Below is a small insight into the fascinating afternoon one Luca spent with another. LUCA: What’s your philosophy as a bartender? LC: My philosophy is to watch what I do and what we do as a team in order to improve every day. To improve we need to have a system that can help me watch what I do wrong from the beginning so we avoid making the mistake again. This philosophy is based on the relation that I have with Gabriele and Edmund, my partners, who are the soul of our work, and this is the reason why I am always the first person into work, and the last one to leave. Sure this relationship cannot be explained, as it’s a feeling, which we apply to all of our team. It’s part of our philosophy to be all on the same page. Despite the title, we are all bartenders doing different jobs. In this way we have a systematic approach to the bar we work on, and together with the responsibility of our job, we know exactly what needs to be done, who’s going to do what and without asking. LUCA: What’s the culture behind your bar? LC: Knowing that we all have a job and duties to do, we work with our personality, in a sense that we all need to do preparation work in different stations and that we need to set each station up for the service. However we do not forget to leave space for our creativity, but ensure we still have structure and standards to follow and of course the delivery of excellent drinks to our clients is always at the forefront of what we do. We also rotate all the stations daily, opening and closing duties, bar back and bartender work, in order to remind everyone that we are all the same and that we need to improve everyday. LUCA: How did you create your menu for Oriole? LC: First we looked at our location and theme. Oriole is a basement bar with colonialism and tropical bar. It has a treasure collection , quite a museum of colonialism travel objects. We have the band on one side and made the clients to be in the center of the attention. Once we looked at those details, we created our team and spent 8 months researching. First we researched what our clients needed and then researched around our concept. 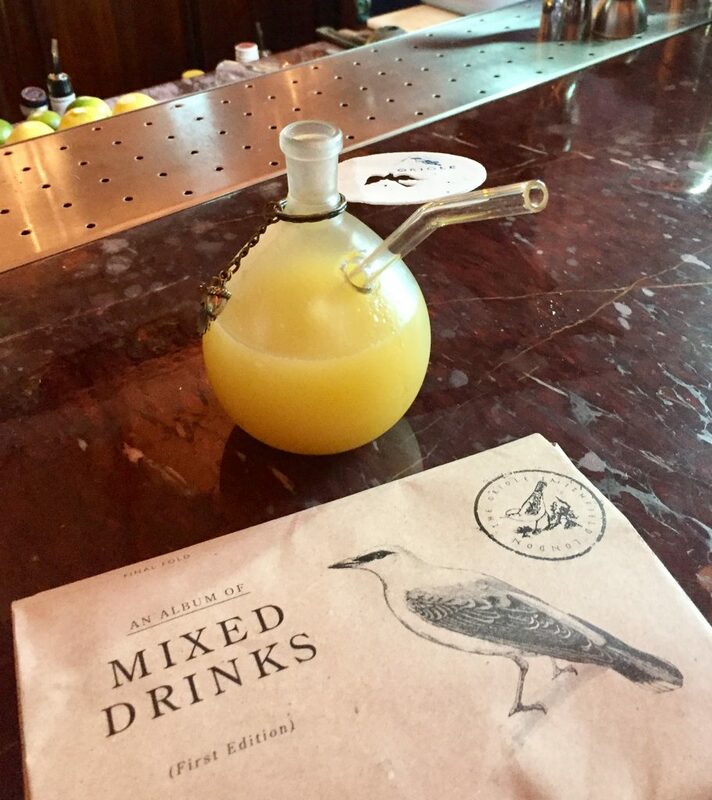 It was important for us to have a colonial and travelling bar theme to our program, so each bartender had to research a different country, understanding its history, ingredients, places and people. Once we have done that we can connect those details with a drink or a situation and we can create placing together those factors. For example, when I was looking at Africa, I connected to my birthplace that is Abruzzi and came up with a recipe for an interpretation of the Affogato. I found herbs in Africa like soap-grass, centerbe and geranium that we can find in both Africa and Abruzzi. We added the freshness of the geranium to the chocolate ice cream made with the Carube Liqueur, we added a dash of the centerbe (which is like an Italian absinthe) to the ice. We then added a ice cream cone inside the glass, we added the ice cream and we garnished with white chocolate truffle, and the interpretation of our Affogato was born. Another example was to create a Daiquiri from Asia, so we discovered that they love yellow courgette, so we cold pressed them, strained through a cheese cloth, added Rum, apricot Jam, pumkin, lemon juice and voila. Seems easy but without that idea to research would not be able to innovate and combining different flavors for different audience. LUCA: what would you be your advise for a young barback to become a great bartender? LC: work, work, work and more work to build the confidence on what you are selling. In our business is vital to built and get the trust of our clients. You need to be his number one choice in order to be stable and consistent. Understand that we would need 30 seconds to make him a drink, however we would need the remaining few hours that he is there at the bar to convince him that we are his number one choice. So you need to analyze him, to talk to him just if we would be seated in front of him on a table of two. Talk to him about your product, how you execute your drinks and enrich is knowledge. Understand that classic style doesn’t mean only in term of cocktails but which means that is the style of the service and of our ethic. Choose wisely your manager and mentor, because would be him to teach all those things, and don’t bother if is always upset with you, keep on learning and keep on taking with head on and look forward to always learn more. LUCA: Do you go out and spot check other bars? LC: Absolutely not. We are people from the industry and we always get the attention of the bartenders working in those bars. Those bartenders they need to be careful that they don’t give more attention to us that to their clients. The clients are the reason they are behind the bars and not us. This is always what I tell to my bartenders. We are always grateful for their visit but priority to our clients first. that we visit. That why when I go to other bars I tend to be very low profile and don’t usually like to judge or stress our colleagues. LUCA: What gives you a wow factor when you enter a new bar? LC: Definitely lightning and smell. If you have a great lightning system you can create a wonderful atmosphere and is the first things you see when you enter, despite the fact if is busy bar or not. The smell is what also put’s you in a good mood. Think for example when you have a smoking cabinet behind your bar and you blowtorch different wood, coffee, dry berries. Its like when you walk into a boulangerie and you smell the fresh baked bread flavor. LUCA: When was the first time that you created a drink and you said wow? LC: One year ago. It was the Milk Punch, created without dairy and with bourboun base. The concept of this drink came from the idea of the American BBQ, so with meat, spice sauces, beer and water. So, we cooked the pasta in water super well done with beer and mushrooms. Then we blended and strained. We then added prekese syrup that has caramel flavor, mustard foam and topped with popcorn dust. Here we created the Priory Horn Cocktail. LUCA: What’s for you a speakeasy bar? LC: It’s a lovely place for guest and a common place for bartenders. It have a great feeling, great atmosphere, brings you back in times, however there is no much you can do as an operator. That’s why after Nightjar, we had to come up with a new style of Speakeasy. The new location gave us the right direction to be more an tropical type, so more a speakitikki one in a colonial atmosphere. Un fortunately tikki is very misused in UK and that we more use the word colonialist bar like the one in the Raffle Singapore, wher still today are seen as an old school bar, with high quality standard and product and a tropical feeling. LUCA: If you are what you drink which drink will you be? LC: I would be a Tom Collin, a very simple answer as its very simple the cocktail. Its because I love sourness and bartender needs sourness. Myself together with the entire bar team, after work we all have a glass of sour drink, could be a mandarin juice or an orange juice. This because it helps to clean the palate after a long day tasting many different type of drinks and textures. I also adore the Gin as I like anything that as complexity as could be also the Pisco or any fortified wines. LUCA: How is right now the Market in UK? LC: Uk is a solid market with solid customers. Customers are looking for service and looking for the latest drinks. I usually answer to this complex question that London is divided into two categories: in the first category there are bars that surprise you with simple drinks and outstanding garnishes. In the second category there are bars that have many machinery behind the bar that makes recreates classic with lots of complexity but served with simple garnish. 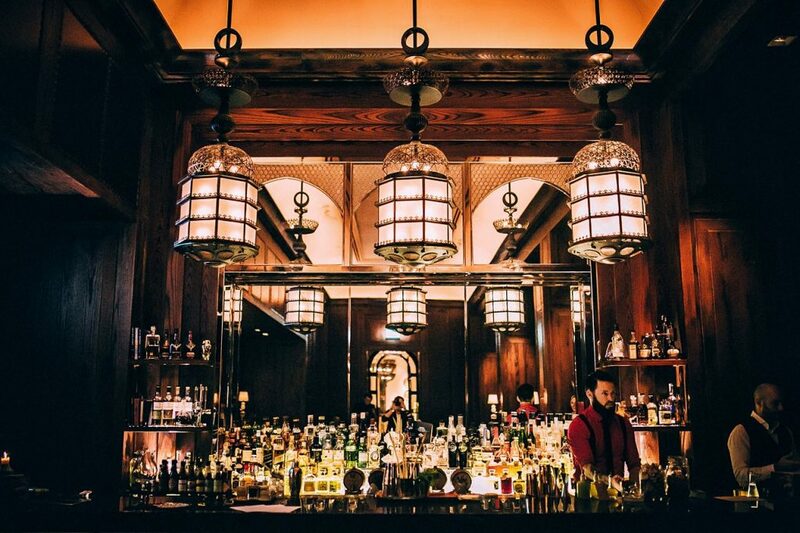 Also London is try to find the right compromise, as it’s a metropolitan city and have an array of different bars and everyone is looking to be different and they are working on their clients and what their clients think about their bars.